Gentler winds Monday morning gave firefighters in Greece some room to breathe, but the respite was only temporary. The cause of the original fire, which belched clouds of heavy, dark smoke, was unknown, and officials were investigating. 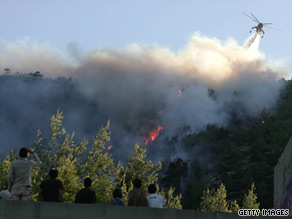 It is the worst destruction seen in Greece since a rash of blazes killed 65 people and razed thousands of hectares of forestland in 2007.